Revolution 5.5% WWI War Bond certificate from the Imperial Government of Russia issued in 1916. 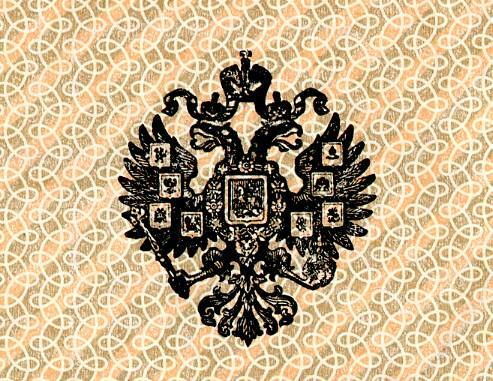 This historic document has an ornate border around it with a vignette of the Imperial Russian Coat of Arms Seal of the double eagle (Romanov seal). This item has been handsigned and is over 100 years old. 5.5% Short-Term State War Bond issued in 1916 on the authorized capital of 2000000 rubles. OBLIGATION in 1000 rubles to the bearer. The debts of this bond will be released in two issues, in 1000000 rubles each, to the (ten year interest holders?) and to the bearer, in denominations of 50, 100, 500, 1000, 5000, 10000, and 25000 rubles. 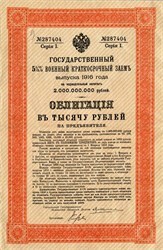 The holder of this certificate is participating in a bond of 1000 rubles, bringing FIVE AND A HALF percent interest per year until the end of the obligation; the interest payments begin on February 1 1916. The payment of capital and interest in this obligation will be forever free from tax of capital income. The interest payments are paid out twice a year: 1 February and 1 August, upon presentation of the coupons at the State Bank and its offices and branches and treasurer's houses of those cities, where there are not facilities of the State Bank, and also in State Savings offices. On the 1st of February 1926 these obligations will be bought up at the nominal price. Each 5.5% Short-Term State War Bond of 1916 issue is supplied with 20 coupons. The coupons from these certificates can be redeemed up to 10 years from the date of their maturity. The obligation can be redeemed up to 30 years from the date of its maturity. The holders of 5.5% Short-Term State War Bond of 1916 issue have the right to exchange their obligations for State bonds of the same or longer maturities, that may be released within the Empire in 1916; moreover, in the payment of the new bonds, the current bond certificates will be taken at their price of issue.